Find a place out on the balcony to watch people walk on the sidewalks below of this colorful Castro multi-intersection. They occasionally serve bar bites and happy hours. My friends and I have been going to Lookout for years and we always have way too much fun! The crowd is always super nice, great music and awesome drinks. Worth checking out! get a strong cocktail from one of the cute bartenders, then take your friends onto the deck that overlooks the intersection of market and noe, the heart of the castro. it's some of the best gay people watching in the world, as guys stream in and out of the gym across the street, cafe flore, and pete's coffee. when it gets chilly go back inside, and enjoy the dj and the crowd at this often packed place. The crowd varies by the day and the event because they do a lot of benefits but its always a comfortable place, friendly bartenders and a great place to meet up with friends. Great drinks & views of SF! Friendly bartenders, strong drinks, great views plus an amazing DJ line-up make this one of the best spots in the Castro. The lookout is great bar with an amazing staff. I frequent the place regularly, i just cannot get enough of it. Not only is it a place for fun but they help raise money for many worthy charities in and around SF. I love this place for it's mixed age crowd (mostly younger, but not exclusively) and it's general laid back feel. My mainstay is the Sunday afternoon "jock sundays". It's hosted by and donates to a local gay sports team each week, so it brings in new folks along with the regulars each week. It gets packed, but with a goodlooking, non-pretentious crowd. Always fun watching people walk by and great place to be on a sunny afternoon. 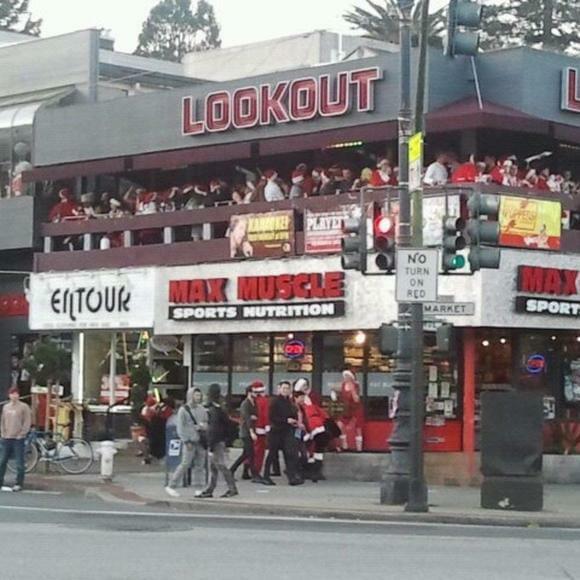 The lookout bar is probably the best place in Noe to people watch. It was my first time going to this bar, and I was completely shocked that the security does not even check my ID. Another thing that puzzled me at first is the drink mix. I ordered a house tequila. The bartender mixed the hard liquor, and I was asked to mix the flavor on my own. The flavor choices are strawberry, lime and guava. The bar also has light snack menu to go along with your cocktail. My strategy for this bar: grab a drink from the bar, find a nice seat on the balcony, and people watch. I checked it out twice. Maybe it's my age, but I remember the bar that used to be in this location in the '80s as a great place to get together with people for conversation and drinks. Now it seems to have been transformed into just another bar like most others with ear-deafening, generic "music" making it almost impossible to talk to anyone ... an awful lot of attitude and posing, too. I fell in love with this bar back when it was Metro, but Lookout has upheld the scene pretty well. Good dance / pop music, great place to hang out with your friends and run into people. The balcony is great for people watching, especially on holidays (Halloween, Bay 2 Breakers, Castro Street Fair, etc).